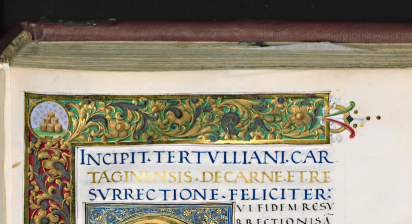 All the classical MSS in Florence now online! Two posts at the Evangelical Textual Criticism blog here and here — neither makes it quite clear — have made me aware that the Laurentian library in Florence has put online a mass of manuscripts! ETC only refer to Greek New Testament mss, but I discover that in fact it is all the Plutei collection. This is the core collection of classical manuscripts at the library. The Biblioteca Medicea-Laurenziana, to give it its formal title, is the library of Lorenzo the Magnificent. Florence was the home of the renaissance, the base of the rediscovery of the classics, and the great library of Nicolo Nicoli ended up in this collection. There are treasures to be found there! Here are the two main Tacitus manuscripts. M1 contains Annals 1-6, M2 contains Annals 11-16 plus the Histories. Tertullian is also here, although the Conventi Soppressi collection is not included, which contains the most important manuscripts. Eusebius on the Psalms, in Greek? Here. Cicero, Seneca… they’re here. In fact if you look at my digest of manuscripts of the Greek classics here, you will find that this collection contains Aelian and half a hundred others. Just search for Tacitus, Tertullianus, Eusebius, and see what you get! This is wonderful, wonderful news. Suddenly it becomes possible for us all to consult these manuscripts. Better still, you can download individual pages and do digital enhancement on them, if you need to. Magic! Well done the BML! After I blogged about this in March, I wrote to the Laurentian library and asked if there was more to come. Sadly, Sabina Magrini of the Laurentian replied that unfortunately their funding will not allow any more digitization. The cheering thing about the Munich digitizations (link) is that they are continuously adding more. The Plotinus C which you list is online, while N is not, but you have the reasonable hope that the N will show up some time in the future. By the way, the German Manuscripta Mediaevalia database has just relaunched. It says on the front page that it catalogs 75,000 manuscripts. I have no idea how many of them are viewable online, but for Munich alone the tally is 2,004, including the cod.graec. series which is on the database for the first time. The new Manuscripta Mediaevalia is still rather buggy, as Klaus Graf (link) tells us this morning, but no doubt they will unkink it soon. Merry Christmas. Thank you so much for this. Your post, indicating how to get the raw images for the mss, was very useful! (I tried to add a comment, but it wouldn’t let me). Thanks for the tip that my comments box doesn’t work. I have now changed the setting for comments on my blog to allow “Anonymous Users”. Also, I played a bit more with Manuscripta Mediaevalia. It claims 25,000 German manuscripts viewable online, but I remain a bit wary of its accuracy. The Manuscripta Mediaevalia site seems to be as buggy as hell. Clicking on “English” did nothing, in IE7 or Firefox. Clicking on “Nur digitalisierte hss” and searching for “Tertullianus” gave no results. Then I did it again without the checkbox on “Nur…” and searched for “tertullianus” and got 11 results. Maybe I am doing it wrongly. What did you do, to get that list of 25,000 digitised mss? I get only 3,000-ish. And I did a couple more searches, then unchecked them all, and … I get 25,000. Hi, I am looking for the 2nd vol. of Bandini’s catalog of Greek manuscripts in Bibliioteca Medicea Laurenziana online. I’ve found the 1st and the 3rd on Google Books but this 2nd one is a kind of a puzzle. Any help is highly appreciated! Interesting question! I don’t know, but I’ll look. Do you have links to the two volumes you’ve found? And … have you tried searching on Archive.org? I’ve found them in the meantime, thanks. They can be found on the website of the Biblioteca Medicea Laurenziana. A simple search for “Bandini Graecorum” will do the trick–it was that simple.